Bock beer is a classic German lager that is smooth and very drinkable. Traditionally bock was brewed in Winter, so it is appropriate for a winter beer article. This week we take a look at some bock beer recipes and how to brew the classic Bock beer style. Bock traces its origins back to the town of Einbeck in Northern Germany as early as 1325. The beer of Einbeck was not only popular but widely distributed to Hamburg and Bremen. Lightly kilned wheat and barley was used in the original Einbeck beer, which had only a remote similarity to the modern bock style. Wheat was used for approximately 1/3 of the grain bill, and barley malt made up the rest. Alas, Einbeck was ravaged by two fires in the 16th century and then suffered greatly in the 30 years war (1618-1648), so little of the original style survives. (Ref: Daniels) In the 16th century, Munich tried to emulate the great beers of Einbeck and started brewing variants that were called “Ainpoeckish Pier”, named in the Bavarian dialect for the city of Einbeck. Later the name was shortened to “Poeck” and ultimately “Bock”, which means “Goat” in German. In the 1800’s bock enjoyed a resurgence as brewing techniques and science improved. The addition of the hydrometer and thermometer, controlled lagering and other techniques helped dramatically. Bock also spread well beyond Munich to Vienna and throughout Germany. German immigrants brought Bock to America in the late 1800’s where it, along with Pilsner became popular. Best & Company (later Pabst) became one of the first to brew it broadly in America. (Ref: Daniels) Bock, traditionally quite strong in Europe, was brewed at lower strength after Prohibition in America. Variants of the bock style include Doppelbock, Maibock, Eisbock, American bock and Weizenbock. Doppelbock means “double bock” and is brewed with a minimum original gravity of 1.074, which is slightly stronger than traditional bock and typically has complex chocolate and caramel flavoring. Maibock, or “May bock” is tapped in the Spring and has a much paler color than traditional bock, and is traditionally made from a mixture of Munich and Pilsner malts. Eisbock, or “Ice bock” which has a minimum OG of 1.093 is a very strong bock that is highly alcoholic and malty. Though made in the tradition of regular bock and Doppelbock, the strength of the beer approaches that of some barley wines. American bock is made primarily in the Midwest and Texas, are typically somewhat lighter in gravity than traditional German bock and may be a bit less malty in flavor. Weizenbock is perhaps better characterized as a Dunkel-Weizen brewed to bock or Doppelbock strength, and not technically a bock beer. It is composed primarily of around 60% malted wheat with Munich or Vienna malt filling the rest of the grain bill, and fermented with wheat yeast rather than lager yeast. 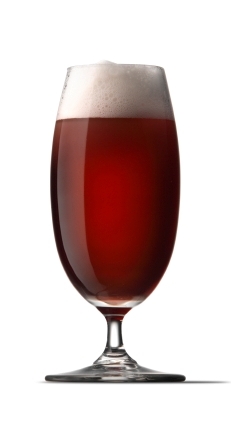 The modern bock style closely tracks the traditional German style of the last hundred years. Bock has a fairly strong original gravity of 1.064-1.072 and a dark amber to brown color between 14 and 22 SRM. German bocks must have a minimum starting gravity of 1.064. The flavor of the beer is malty with a slight chocolate or toasted edge. Bocks have medium to full bodied profiles, but no roast flavor. The carbonation is moderate, and hop flavor is minimal. Typically German hops are used to balance some of the maltiness of the beer with an IBU level of 20-27 IBUs. Lager yeast is used along with cold temperature storage (lagering) at temperatures near freezing. Munich malt makes up the bulk of the grain bill for any Bock. In fact, most traditional Bocks are made from a single Munich malt, with variations in kilning determining the color and character of the finished beer. Daniels recommends using Munich malt for 75-93% of the grist,with pale or lager malt making up the balance. For all grain brewers, this is your best route to an authentic bock. Where possible, choose a two row Munich malt as the base. Analysis of many award winning homebrewed recipes indicates that crystal and chocolate are often added – especially for the dunkel (dark) bock varieties. Crystal makes up 10-15% of the grain bill and chocolate approximately 2% – primarily to add color. For extract brewers, try to secure a munich based malt extract if possible, as it is difficult to achieve the proper malty balance without it. Extract recipes often use some crystal or chocolate malt to achieve the appropriate color and body, but these should be used sparingly. If you are brewing a partial mash recipe, the addition of munich and pale malt will add authenticity to the recipe. Not surprisingly, German hops are used extensively in Bock. Hallertauer hops is the traditional choice for bock, though Tettnanger, Hersbruck or Saaz are occasionally used. Do not use high alpha hops in a bock as it will upset the malty balance. Bock is not a hoppy beer, so the bulk of hop additions are used during the boil for bitterness. Small flavor or aroma additions are OK, but hop flavor and aroma is not a dominant feature in this beer. The traditional mash schedule for a German bock is a triple decoction, though with modern highly modified grains a double decoction will suffice. Decoction does help to enhance the color and body of the beer to bring out the strong malty profile of a traditional bock. The protein rest should target around 122F, while the main conversion should be done at a slightly higher temperature of 155-156 F (68C) to bring out the desired medium to full body beer profile. A single infusion mash is also an option, again in the 155F range. Munich water profiles have a high proportion of carbonate which is why hops are sparingly used to avoid harsh bitterness. However, most domestic brewing waters can produce a good bock style since the darker bock malts help provide the proper mash pH balance, and adding carbonate really does not enhance this particular style. Munich/Bavarian lager yeast should be used for your bock recipe. Cold lagering during fermentation and storage is critical. The fermentation temperature should match the recommended range for your yeast, but fermentation is usually done around 50F. Once fermentation is complete, the actual lagering should take place close to freezing, and continue for 4-10 weeks as these lager yeasts often take some time to flocculate (sediment). For more recipes, you can visit the BeerSmtih Recipe Site or our discussion forum. Thanks again for visiting the BeerSmith Home Brewing Blog. Don’t hesitate to subscribe for regular weekly email delivery, or drop a few votes for our articles on the BrewPoll brewing news site. I’ll be back again next week with another brewing article. Thank you for your post, it was very interesting to read. I always like to read and write about this kind of craftsmanship. Great writeup. I’m curious about where are you getting information about hops in bock? It was my understanding that traditional Bocks contain no added hops, which is why they end up with a sweet malty flavor, and why they are usually marked as “malt liquor” when imported to the US. Hi – All modern Bocks use hops for bittering to balance out the malt. They have relatively low levels of hops for the amount of malt, but hops is still a critical component. For reference, see the BJCP style guide for various IBU bitterness levels for bocks. I just bottled a Doppelbock, my first. I used a decoction mash, and it is very, very malty. I did a diacetyl rest, but I think the fermentation was already finished. I am wondering if the flavor I am tasting is diacetyl, or caramelization from the decoction. BJCP guidelines for Scotch ale suggest that kettle caramelizqation can easily be confused for diacetyl. I’ve never been very good at detecting diacetyl. Is there some good way to tell the difference? The article mentions Munich malt for the majority of the grain bill, but the all grain example has Pilsner malt as the base. ?? Regardless, good article, but bad examples. Pilsner is sometimes used in place of Pale malt in many German and Continental recipes, but I would certainly prefer Munich in my Bock! Enjoyed the article, i used to bock beers while stationed in Germany. I would like to try home brewing. Where can i research step by step instructions. Chief baker of the household, just need some guidance!